Species description: Flying reptiles from 251 million to 65.5 Million years ago that had wingspans from a ft to 40 ft long, which had great eyesight to spot and catch prey on the ground . They ate small retiles, mammals and anything smaller that moved so it’s a meat eater which lived in America, Africa, and Austrailia . They had claws of feet on wings to secure prey also which is unique among all animals ever. Item rating and description: 1-10 9.3 Not complete, however all original , Rare Large Pterodactyl 5” x 3”Section of Jaw with Tooth. While only a section it is an unknown species that may be one-of-a-kind. ad one almost complete No restore ,no breaks on this section and no work done. This is a section of one of rarest pteradactyls ever found For sure. This is a prize . If an American one it would go for huge money so here is your chance. I love it . This piece is amazing . I can’t say enough so here are the pictures for you .This was found last year . Since not complete you get a bargain. If complete it would be a fortune . I really paid more than this so this is under wholesale to get your business. Item rating and description: 1-10 9.8 Complete Pteradactyl Lower Jaw 6.5”“ with Teeth Sockets and front ridges of Unknown Flying Reptile. This is a different species as its thicker with a front of lower jaw not near as sharp or pointed. These ridges are like teeth and help in securing prey so it’s a carnivore .This is my first complete one from a mid size Ptero . All original from same reptile as lines show and only gluing of one break.. No restore and no repair except for that one break . It is so gorgeous. This may be a one-of- Kind only complete specimen ever found of this different species .So its extremely valuable .This is a lower jaw of one of rarest pteradactyls ever found –unknown species for sure. This is a prize. If an American one it would go for huge money so here is your chance. I love it . This piece is amazing. I can’t say enough so here are the pictures for you .This was found last year . Since the seller had no idea what he had I got a great price so Ill pass on to you WOW. 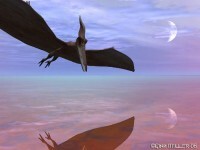 Species description: Flying reptiles from 251 million to 65.5 million years ago that had wingspans from 1 ft to 40 ft long. They had great eyesight to spot and catch prey on the ground. They ate small reptiles, mammals and anything smaller that moved so it’s a meat eater which lived in America, Africa and Australia. They had claws on their feet and wings to secure prey. This is very unique compared to any animal that ever existed. Item Location: Morocco, North Africa – South of Taouz Morrocan Sahara. Item rating and description: 1-10 9.8 Multi 95 Million year Old Set(3) of 2 Ptero Claws (1 Foot),2 leg or wing bones, 2 great teeth, an 2 bird claws . The quality of bone on all of these is amazing. Top premium claws also highlight this offering. Both claws are all original and great with one foot claw 1.5”.It is worth a fortune . Now in USA these claws are not even found- only wing claws and they go for 1000 each. You have one wing claw also with this . These items are fanatastic. You get all these items for the price of one claw. You just don’t find claws anymore though teeth are found. Bird claws are rare also with a few shown here with both complete. I’d say the detail on these pieces including claw is excellent with great grooves .Both teeth are great. Remember claws are very very desireable and you get 2 with this. This is a chance to own history at a fraction of what an American set would cost you . Actually no American foot claws are found. Pterodactyl lovers will just admire this set . Moroccan items can be nice and these are authentic in every way with no restore-offered just as they were found .I have requests for this flying reptile more than any other fossil . Some people say they still see them in remote parts of the world. What a way to own Nature’s Sweet Beauty . This is from an old collection so again these are not found any more except teeth –2 claws and you have other items of the body also for a super low price . If these were found in USA one claw would be over 2000 alone . Wow what a deal. By buying a package you also save money. I haven’t had any in awhile until this old collection surfaced. These could be my last. The price is so amazing also. I really dropped this down a lot for quick sale . This is a wholesale price, and will be the first to go. Item rating and description: 1-10 9.7 Great Pterodactyl Set with 2 Wing Claws , 1 A Tooth and an Arm Bone. The quality of bone on all of these is amazing . Top premium wing claws also highlight this offering with a large one and smaller one from 2 different species of pterdactyls . Both claws and other pieces are whole . Now in USA these wing claws are going for 1000 each. I don’t even want one third of this . These items are fanatastic. You just don’t find claws anymore anywhere . These are from an old collection . The other pieces are complete and rare also. Id say the detail on these pieces including claw is excellent with great grooves on the claw. The teeth is Grade A. Remember claws are very very desireable and you get 2 with this . This is a chance to own history at a fraction of what an American set would cost you . Pterodactyl lovers will just admire this set . Moroccan items can be nice and these are authentic in every way with no restore- offered just as they were found .I have requests for this flying reptile more than any other fossil . Some people say they still see them in remote parts of the world. What a way to own Nature’s Sweet Beauty . This is from an old collection so again these are not found anymore except teeth –no claws and you have other items of the body also for a super low price . Wow . By buying a package you also save money . I haven’t had any in awhile until this old collection surfaced. These could be my last .The price is so amazing for you as I got the price I needed after much negotiation. Item Rating and Description: 1-10 8.8 Pterodactyl 5 Teeth Set #1 From Many species . Most of these are very large and sharp points except 1 . These are really not found often as all pterodactyl items. These are with darker and lighter enamel and are fine teeth and all huge teeth except 1 . IT shows how sharp these were and how long for a huge bird so it’s a chance to own a beautiful piece of history at a fraction of what an American set would cost you – Pteranadon lovers. I am very careful in choosing my Moroccan items and these are absolutely authentic in every way with no restoration on any of these items. All 100% Natural . Some people, still believe that these creatures are still alive in isolated areas… (You Decide)!!! This is from an old collection, so again, these are very rare. Wow what a deal! This can be yours and comes with a display case. It comes with a case and Great Pteradactyl teeth go for $85 a piece. These are x-fine teeth worth 50 each easily . Item rating and description: 1-10 9.5 Unbelieveable Pterodactyl Set with Two Claws and 1 grade A Tooth. The claws appear to be large wing claws but they could be small foot claw also. The claws alone are worth a fortune as in USA these claws go for 1000 each . If they are foot claws they w are worth much more These items are fanatastic . While not totally prepped fully they are still quality claws with a top premium tooth You just don’t find claws anymore though teeth are found. Wing claws are highly desireable .Id say the detail on these claws is very good. If large wing claws , USA wing claws smaller go for $1000 apiece so what a deal . The tooth is nice as well . Remember claws are smaller even though the reptile was big. It’s a chance to own history at a fraction of what an American set would cost you .Pteradactyl lovers . Moroccan items can be nice and these are authentic in every way with no restore-offered just as they were found . I have requests for this flying reptile more than any other fossil . Some people say they still see them in remote parts of the world. What a way to own Nature’s Sweet Beauty . This is from an old collection so again these are not found anymore except teeth –no claws and you have two for super low price . . If these were found in USA these two claws are worth 2000 plus. Wow what a deal . By buying a package you also save money . Item Rating and Description: (1-10) * 9.8*– Claws like this 1 ¼” Just aren’t found anymore . This is either a large wing claw or more likely a foot claw from a smaller species of Pterosaur When they are found they sell right away , and have increased in price to 2000 per claw on the larger ones . However these are what is left of an old collection where the owner paid much less so I’ll pass the savings on to you . This one is amazing. No resto so claw is original that was found whole. All original claw from an unknown species 1 1/4 inch with beautiful darker color. It has a little matrix on it to keep secure. That what shows it’s an unknown rare species. I’d just put these on whenever I get one and they sell in minutes. They only know of a few species in Africa so this is unnamed. If you look close you will buy this. This should go for $1000. In USA small wing claws smaller than this start at $1000 apiece so here is your chance. This claw is worth at least $1500. Item rating and description: 1-10 9.5 Unbelieveable Pterodactyl Set with Two Claws and 1 grade A Tooth. The claws appear to be large wing claws but they could be small foot claws also. The claws alone are worth a fortune as in USA these claws go for 1000 each . If they are foot claws they w are worth much more These items are fantastic. These are quality claws with a top premium tooth .You just don’t find claws anymore though teeth are found. Wing claws are highly desireable. Id say the detail on these claws is very good at least . They look amazing in color also . If large wing claws , USA wing claws smaller go for $1000 apiece so what a deal . The tooth is nice as well . Remember claws are smaller even though the reptile was big. It’s a chance to own history at a fraction of what an American set would cost you .Pteradactyl lovers can step to the plate here . Moroccan items can be nice and these are authentic in every way with no restore-offered just as they were found .I have requests for this flying reptile more than any other fossil . Some people say they still see them in remote parts of the world. What a way to own Nature’s Sweet Beauty . This is from an old collection so again these are not found anymore except teeth –no claws and you have two for super low price .. If these were found in USA these two claws are worth 2000 plus. Wow what a deal . By buying a package you also save money . I haven’t had any in awhile until this old collection surfaced. The price is so good for 2 claws plus a Grade A tooth worth a lot also.